Directs all culinary and associated activities either personally or through subordinate managers and supervisors. Oversees the assignment of duties and responsibilities, observes and evaluates employees and work procedures. Reviews financial transactions, monitors the budget and reviews current operating procedures for revenue enhancement opportunities. Oversees all culinary presentations, activities and quality in all venues. Oversees all special events requiring culinary staff. Reporting directly to the Executive Chef, this position manages the activities of a large section of the galley engaged in preparing and cooking soups, meats, vegetables, desserts and other food served in a variety of dining venues. Manages the financial aspects of the assigned food operation including the successful identification of expense reduction through cost control. Ensures the continuous and accurate participation of the food service operation. Analyzes operational problems such as over production, wastage, theft, and establishes controls. Reviews the overtime requests against production levels to determine appropriate needs and approves amounts accordingly. Supervises and coordinates activities of a particular workstation engaged in preparing and cooking food products for various outlets. This is a senior middle management level that has worked in four different sections of the galley as a Chef de Partie 3 or Chef de Partie 2 and has been certified into the Chef de Partie 1 position. The position should be developed to become a Sous Chef in all areas of management; responsibility, knowledge, skills and craftsmanship. Observes and evaluates employees and conducts on the job training. Ensures the smooth and efficient operation and control of the Bakery Shop and production on a day-today basis according to the company policies. 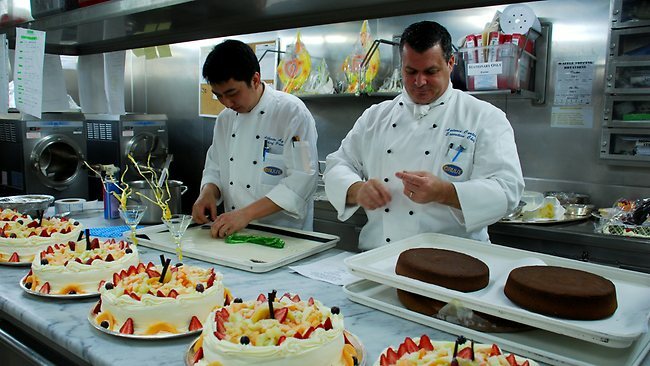 Pastry team is in charge of producing the wide variety of delights available to our guest onboard our ships; items include: sweets cold and frozen, ice creams, ice cakes, pudding, chocolates, and more! Advanced pastry cooking methods, knowledge of mix techniques, and experience in a high volume pastry production environment are helpful when joining this team. This position is a member of a team responsible for cooking and preparing one or various food types which may include soups, meats, fish, vegetables, desserts and other foods served in a variety of dining venues. Reads menu to estimate food and time requirements to ensure speed and efficiency. Must be able to follow recipes provided. Collects items from workstation storage or orders food from provision stores. This position is responsible for the preparation of various menu items according to the provided recipes and photos. Will be assigned a station in the hot galley by the Executive Chef that can be changed from time to time in order to get familiar with the various tasks in the assigned area. Assists with the transportation of food items from the main stores to the galley. Duties include the cleaning and sanitizing of his/her working area and working utensils following the United States Public Health rules and regulations and all times. This team ensures the smooth and efficient operation and control of the butcher shop. Responsibilities include handling, cutting and preparing all items such as: meat (beef, lamb, pork, etc. ), poultry, seafood, and fish. The team also has to adhere to USPH standards and ensure their daily work produce minimum waste. To join this key part of our culinary operation, previous experience in a similar role is required. 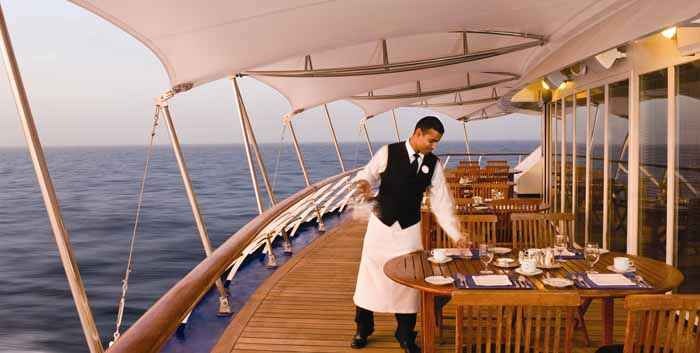 As Traveling Food & Beverage Director, you will be role responsible for the overall guidance of F&B Operations and talent development onboard the ships within their assigned capacity. The travelling F&B Director is responsible for creating, proposing and supporting brand initiatives and leading shipboard Food and Beverage Directors/ Managers and their teams in an effort to achieve company division goals and key performance indicators. Onboard, the position acts as a conduit between shore-side leadership and shipboard operations. He/ She will provide the necessary shipboard support needed to hit quarterly targets and will share accountability for results. The Traveling F&B Director must develop and maintain ongoing relationships with the shipboard leadership team in order to successfully execute the new F&B vision. Manages all the food and beverage service activities either personally or through subordinate supervisors. Oversees the allocation of staffing resources to various venues based on guest traffic flow. Observes and evaluates employees and work procedures to ensure quality standards and service is met. Approves personnel actions such as new hire requests and discharges, to ensure proper staffing. Provides final approval for overtime needs. Mentors, develops and provides on-the-job training to subordinates to strengthen their current performance and preparation for future advancement. Reviews financial transactions and monitors budget to ensure efficient operation and to ensure expenditures stay within budget limitations. Overall responsibility for shipboard beverage operation. Directs the bar function and associated activities either personally or through subordinate supervisors. Manages a staff of up to 140 employees and the financial aspects of the bar operation including the successful identification of expense reduction through cost control. Analyzes operational problems such as over production, wastage and theft and establishes controls. Suggests, serves and sells beverages to guests seated at tables or standing in bars, cocktail lounges or for special events. Takes all beverage orders and relays them to the Bartender. The Bar Server is responsible for asking for proper identification to determine minimum drinking age and the responsible service of alcoholic beverages. Ensures drink orders are correct and served properly. Computes the bar bill and presents for payment collecting charge cards for drinks and enters the correct information in the point-of-sale system. As Assistant Beverage Manager, you will be responsible for our exciting, multi units, high-volume shipboard Beverage Operation and oversee its multicultural world-class team. You will be responsible for assisting Operation of our state of the art ship’s (all bars/lounges, restaurants, venues and crew dining areas). Our multi-million dollar beverage operation is an integral part of our success, and this fast-paced division provides a challenging and rewarding professional environment. Responsible for supporting and maintaining the cleanlineness of bar work areas, glassware, equipment and utensils and keeping them orderly and in stocked condition. Removes trash and garbage and segregates into the proper containers. Places glasses in the proper racks or on conveyor for the dishwashing machine, operates the washing machine, retrieves glassware and restocks as necessary. Collects and transports a variety of supplies between storage and work areas. Mixes and serves alcoholic and non-alcoholic beverages to guests in various bars, lounges and service areas. Takes orders from guests or Bar Servers, asks for appropriate identification to determine minimum drinking age. Is able to converse with guests, answer questions and promotes drink specials. Collects charge cards for drinks served and accurately enters data in the point-of-sale system. Manages the wine inventory for all restaurants including maintaining accurate par levels, rotating stock, requisitioning of all wine and supplies. Full responsibility for all accounting procedures related to wine sales and inventories. Recommends and implements ways to maximize wine order revenue and minimize costs. Identifies slow or non-moving wines and manages their depletion. Baristas serve and suggest all food and beverage items offered in assigned cafes while acting in a courteous, friendly, and professional manner - in accordance with standards, procedures, and specifications outlined by the Company - at all times. He/she is expected to have excellent knowledge of the coffee, tea, and specialty beverages available in his/her assigned cafe, and to create opportunities for guests to interact with the products. Baristas are responsible for ensuring that guests leave the cafe satisfied by providing quality beverages and always keeping the area clean and visually-appealing. A minimum of one year food service/hospitality-related experience is required for this position. As our Assistant Restaurant Manager, you will be a part of our exciting and passionate shipboard Restaurant Operation team. Supervise the activities of dining room and employees engaged in providing professional and courteous service to our guests. Manages the activities of the dining room and employees engaged in providing professional and courteous service to guests. Utilizes appropriate food and wine terminology and pronunciation. Maintains familiarity of menu descriptions and wine lists in order to discuss items appropriately with guests. Actively works to educate all dining room employees on the appropriate terminology, as well as keeping the staff aware of industry trends in the food and beverage function. Assigns duties, responsibilities and workstations to employees. Observes and evaluates employees and work procedures to ensure quality standards and service is met. Cleans all restaurant areas including the dining room and specialty areas. Operates all equipment such as steam cleaners, scrapers, brooms and a variety of hand and power tools. Uses a variety of cleaners and chemicals, dusts furniture, washes windows, walls, ceilings, woodwork, door panels, polishes brass and other metal fixtures. Maintains the cleanliness of galley work areas and galley equipment and utensils in a clean and orderly condition. Follows proper washing and sanitation of assigned work areas, washing pots, pans, equipment, dishes, glasses and silverware, etc. Utilizes proper US Public Heath sanitation procedures at all times and practices careful handling of all galley equipment in order to avoid damage through neglect or carelessness. Sweeps and cleans galley deck, scuppers, walls and ceilings. Washes worktables, grills, trolleys, galley hood system and ventilation. Segregates and removes trash and garbage and places it in designated containers. Maintains the provision area in a clean and orderly condition and assists in the inventory function. Receives, stores, and issues food and beverage and related items. Maintains proper inventory management techniques (FIFO), requisitioning guidelines, shrinkage and spoilage logs. Utilizes proper key control procedures. Arranges food according to stock and rotates food items to ensure the freshest quality. Follows procedures for disposing of spoiled items and transports to designated collection areas. Operates forklift and other related equipment. Supervises and coordinates the activities of the Room Service function and the employees engaged in providing courteous and professional service to guests, by performing the following duties. Trains and monitors room service employees for proper service. Provides on-the-job training to Waiters and Assistant Waiters to strengthen their current performance and preparation for possible advancement to promotional positions. Supervises and coordinates activities of a section of Restaurant employees engaged in providing courteous and professional service to the guests in accordance with company policies. Provide service to guests in all Restaurant Operations areas by performing the following essential duties and responsibilities: Learns and uses appropriate food and wine terminology and pronunciation. Becomes knowledgeable of menu descriptions and wine lists in order to discuss items appropriately and to enhance the guests' dining experience. Provides on-the-job leadership and guidance to Assistant Waiters to strengthen their current performance and in preparation for possible advancement to a Waiter position. Obtains linen, silverware, glassware, and china to set tables. Arranges settings on tables per Company Standards. Provides food service to guests in all Restaurant Operations areas. Participates in rotational service delivery schedule, working in casual dining service and various other food and beverage service venues. Observes all established security and guest privacy procedures when delivering to staterooms. Provides assistance and support to assigned team of Waiters while working in the dining room to ensure efficient and seamless service delivery of all meals to guests. Learns and uses appropriate food and wine terminology and pronunciation to enhance the guest's dining experience. Becomes familiar with menu descriptions and wine lists in order to discuss items appropriately with guests.